For $1,750, Is This 1985 Volvo 740 Jalop Nirvana? Okay, the only way that today's Nice Price or Crack Pipe Volvo could in any way be considered undesirable is if it were filled with ebola monkeys and Taylor Swift's new CD. Of course, desirable is different from affordable. So, are you a Celican, or a Celican't? It turns out that at thirteen large, even packing a Lexus V8 couldn't keep yesterday's old school '77 Celica Liftback from garnering a collective Meh, a fact that was evidenced by its 62% Crack Pipe loss. Today's 1985 Volvo 740 check's almost all the right boxes - at least as far as Jalops go - offering as it does a diesel engine, a turbocharger, a manual gearbox, rear-wheel drive, and having been built by Gothenburg's finest (and our not so secret crush), Volvo. Let's take each of those fine attributes one at time, shall we? First off- diesel. Syrupy and possessing higher thermodynamic efficiencies than does gasoline, diesel is a favored fuel of those who can't get enough of the sound of marbles rattling in a can, and who hate the thought of ever having to gap a spark plug. The diesel engine here is the Volkswagen D24T, a SOHC inline six of about 110-bhp. This one is said to have but 30,000 miles under its belt while in this car. No word on how many in total however. Next up- a turbocharger. Yep, along with that reassuring rattle that is only made by a diesel, or possibly a gas engine about ready to throw a rod, this engine has a turbocharger that plays backup with a jet engine-like whine. It also helps to make that 110-bhp, and gives you the bar room bona fides to say; yeah, I drive a Turbo. Manual gearbox. Oh yeah, row yer' own, do the right-hand dance, slip the stick, three-pedal two step. That's what I'm talking about. Backing up the VW diesel here is one of Volvo's traditional 4-speed with its electrically-actuated Laycock de Normanville overdrive for dropping the revs on the open road. A new clutch separates the engine and cog box. Rear-wheel drive. Volvo's 700 (and related 900) series were the last from the company to feature a longitudinal engine and rear wheel drive. The dynamics of rear-drive are generally considered to be preferable to front-wheel drive as oversteer is vastly more entertaining than understeer. Of course with about 3,300 pounds and 112-bhp, well, good luck with that. Volvo. Yes, we love Volvos. Boxy but good, the box it came in, styled but not stylish, the old Volvos look as good today as they did when new. And of course they tend to be troopers when it comes to keeping things together - at least up until the '90s models - so they almost always make for a good investment. This one has had some help along the way, in the form of new ball joints, an alternator, brake pads and the like. The ad notes that it runs great, so it's got that going for it. Okay, what's not to like here? Well, it could be a wagon, I mean they made those too. What's up with that seller, why isn't this a longroof? You know that would have sent us all into paroxysms of joy so great that some of us would have likely peed ourselves. Nice way to miss an easy opportunity. The only other thing that could possibly sour us on this seemingly amazing ride is if it were to be priced inappropriately, and you're about to decide that fate right now. 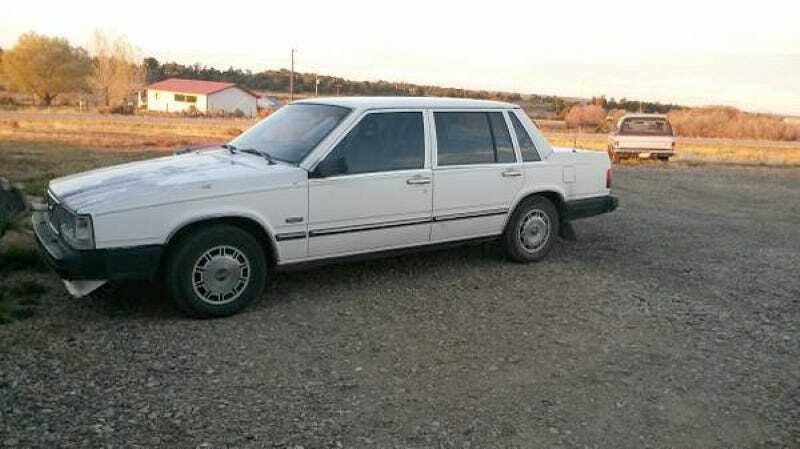 The seller is asking $1,750 for this diesel, turbo'd, row-yer-own, rwd Volvo. What do you think, is that price the cherry on the top of the Jalop sundae? Or, is that close but no cigar? Westslope Craigslist, or go here if the ad disappears. H/T to xsnowpig for the hookup!